It was well known that tremendous profits were to be obtained for anyone who could achieve a direct trade connection with Asia. This was the main driving factor for the Portuguese explorations of the Indian Ocean, including the sea of China, resulting in the arrival in 1513 of the first European trading ship to the coasts of China. The German terms “Seidenstraße” and “Seidenstraßen”- ‘the Silk Road(s)’ or ‘Silk Route(s) were first used in 1877 by Baron Ferdinand von Richthofen, who made seven expeditions to China from 1868 to 1872. The Silk Road gets its name from the lucrative Chinese silk trade, a major reason for the connection of trade routes into an extensive trans-continental network. Extending 4,000 miles (6,500 km), the routes enabled people to transport goods, especially luxuries such as slaves, silk, satin and other fine fabrics, musk, other perfumes, spices, medicines, jewels, glassware and even rhubarb, as well as serving as a conduit for the spread of knowledge, ideas, cultures etc. The Silk Road was a significant factor in the development of the great civilizations of China, India, Egypt, Persia, Arabia, and Rome, and in several respects helped lay the foundations for the modern world. 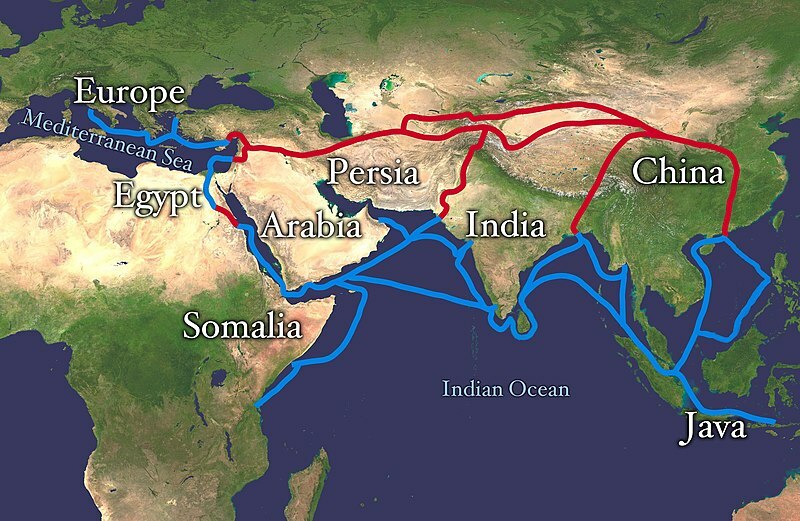 This extensive interconnected network of trade routes across the Asian continent was connecting East, South, and Western Asia with the Mediterranean world, as well as North and Northeast Africa and Europe. Extending from southern Europe through Egypt, Somalia, the Arabian Peninsula, Iran, Central Asia, Pakistan, India, Java-Indonesia, and Vietnam until it reached China. Project “Silk Road” is a research concerning how the extensive interconnected network of transit routes - across the Asian continent has developed. The rail links offer the potential to greatly shorten the distances and reduce transit times between countries and regions, while being a catalyst for the notions of international transport as a tool to trade expansion, economic growth and cultural exchange. 1. The Northern Corridor – NC –the Trans-Siberian Railway TSR / Trans-Siberian Line, goes from Western Europe to Eastern Asia connecting Netherlands, Germany, Poland, Belarus, Finland, Sweden and Russia. The 9 200 km long TSR covers much of this routes and currently carries large amount of freight from East Asia to Moscow and further on to the rest of Europe. 3. The Southern Corridor – SC – goes from Western Europe to Southeast Asia connecting Germany, Austria, Hungary, Croatia, Serbia, Romania, Turkey, Iran, Pakistan, India, Bangladesh, Myanmar and Thailand, with links to China’s Yunnan Province and, via Malaysia, to Singapore. 4. The Transport Corridor Europe-Caucasus-Asia – TRACECA – goes from Western Europe to Central Asia, connecting Netherlands, Germany, Austria, Hungary, Romania, Ukraine, Moldavia, Russia, Bulgaria, Georgia, Azerbaijan, Turkmenistan, Uzbekistan, Kyrgyzstan, Tajikistan, Kazakhstan and China. 5. The North-South Corridor - NSC – goes from Northern Europe to the Persian Gulf. The main route starts in Helsinki, Finland and continues through Russia to the Caspian Sea, where it splits into three routes, a western route through Azerbaijan, Armenia and Western Iran, a central route across the Caspian Sea to Iran via ferry, and an eastern route through Kazakhstan, Uzbekistan and Turkmenistan to eastern Iran. The routes converge in the Iranian capital of Teheran and continue to the Iranian port of Bandar Abbas.